Despite a quarter century of "nation building," most African states are still driven by ethnic particularism—commonly known as "tribalism." The stubborn persistence of tribal ideologies despite the profound changes associated with modernization has puzzled scholars and African leaders alike. The bloody hostilities between the tribally-oriented Zulu Inkhata movement and supporters of the African National Congress are but the most recent example of tribalism's tenacity. 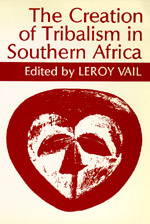 The studies in this volume offer a new historical model for the growth and endurance of such ideologies in southern Africa. Leroy Vail is Professor of History, Harvard University.